Can you make a full meal in just 20 minutes? YES, you can! Do you ever feel like you want to give your family a good home-cooked meal but time is not your friend? Although I cook at least 6 times a week, there are days I am scrambling around trying to figure out what I can cook in a short amount of time. I then remember my go-to, quick fix meal... stewed salmon, green beans and rice. In the time it takes your rice to cook you can have the entire meal cooked and ready to serve. 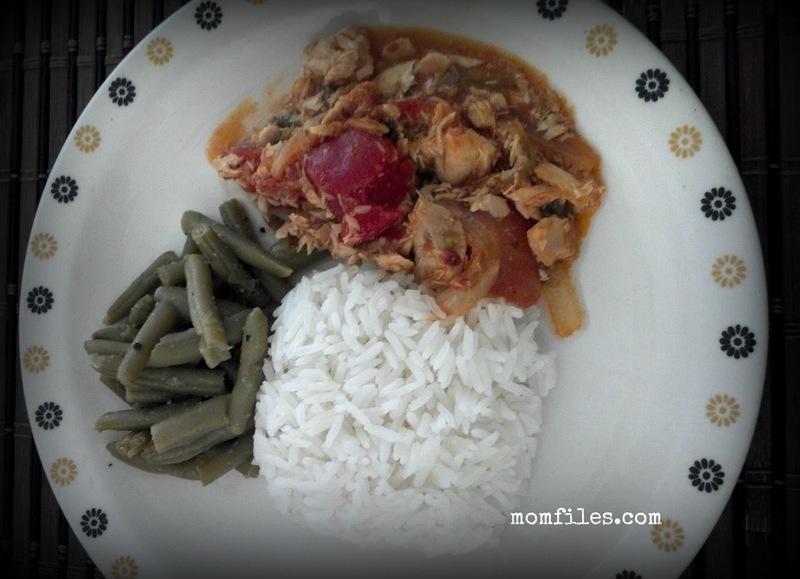 All you need to make this meal is a can of salmon, a can of stewed tomatoes (or you can use fresh), some sliced onion, garlic and herbs of your choice, a few squeezes of fresh lemon or lime juice, frozen or fresh green beans and any rice you like. All I do is put my rice on to cook first. I then slice up my onion, garlic and herbs and throw them in my pan with a little bit of oil. I then put my can of tomatoes in and a few squeezes of ketchup, lemon juice and some dry seasonings. While that is cooking a bit, I put my green beans on. In goes my salmon into the tomatoes and I simmer it for a bit and add extra seasonings if needed. By the time the timer for the rice goes off, the entire meal is done. This meal costs me about $8 and my family loves it. Do you have a favorite go-to meal that is quick and easy? I sure can relate to the scrambling around... I like to spend as much less time in the kitchen as I can ! I am in luck.. I just picked up Salmon to make Salmon patties, but will switch off and give this a trip.. will be back to let you if they liked it.. keep posting any more quickie recipes! Maybe I could tell my dh that its chicken and he will eat it. If I tell him that it's salmon he most likely will not taste it. Looks amazing though, and in that amount of time it would be one of my favorites too!